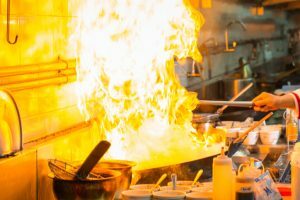 Flash fires are a real danger in commercial kitchens in restaurants and hotels. Flash fires can be absolutely devastating because they can cause harm to people and damage equipment. Plus commercial kitchens have to close to make the necessary repairs, resulting in lots of lost income. Flash fires used to be much more frequent – but now because of modern tools and techniques, thankfully, flash fires don’t occur very often. There are various essential steps you need to take to ensure your commercial kitchen is protected from the dangers posed by flash fires. Most causes of flash fires are cause by grease, which is a natural byproduct of many cooking processes. When food is regularly grilled or fried food in your commercial kitchen, grease naturally builds up over time. When fats are heated, they change from solid to liquid as oil. Low temperature cooking creates more liquid grease, while high temperature cooking produces more grease-laden vapor. When that vapor is sucked into the exhaust hood, it cools and settles on surfaces inside the exhaust system. As the grease settles on the exhaust system parts, the possibility of a flash fire increases. That’s why it’s absolutely essential to have your kitchen exhaust system cleaned regularly. Not only will it prevent flash fires from becoming possible, but it’ll make your entire kitchen much cleaner and more sanitary. Call Flue Steam at 800-700-FLUE to sign up for kitchen exhaust system cleaning services today. We offer complete hand scraping and steam cleaning service for commercial kitchen exhaust systems. Hand scraping is a simple and affordable way to remove grease deposits from accessible areas. We recommend you sign up for hand scraping services at least once a month. Steam cleaning services involve using hot, high-pressure water to remove even the most inaccessible grease hidden in your commercial kitchen exhaust system. Many businesses elect to have steam cleaning done 2-4 times per year, in addition to hand scraping services. You won’t have to worry about meeting NFPA code obligations when you partner with Flue Steam for all your exhaust system cleaning needs. Flue Steam provides “Certificate of Performance” stickers after each job as proof that your commercial kitchen meets all NFPA code obligations. Code inspectors will always be glad to see the stickers, plus you may even save money on your insurance bills as a result. Call Flue Steam at 800-700-FLUE to schedule your first commercial kitchen exhaust cleaning service. The safety of your commercial kitchen is extremely important to all of us at Flue Steam. That’s why we also provide automatic fire suppression system and portable fire extinguisher services. 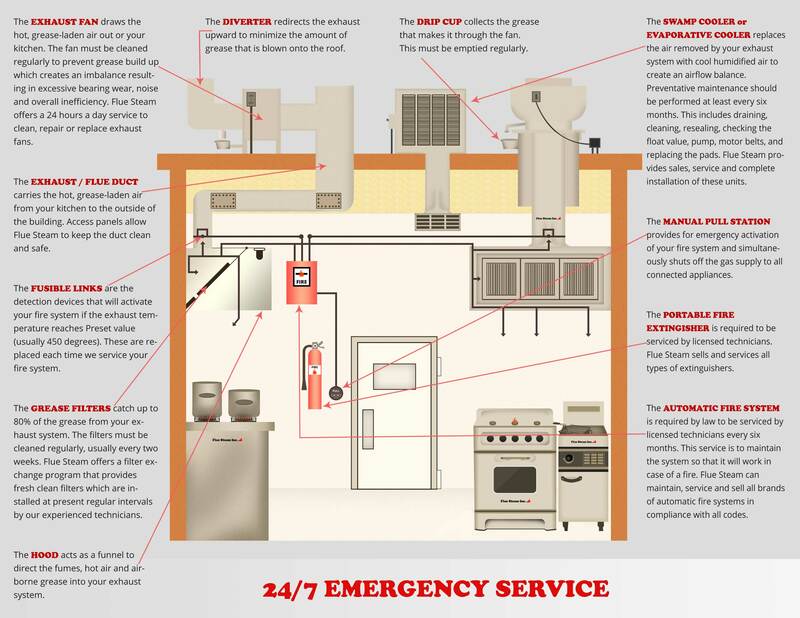 We’ll gladly install and maintain these essential fire prevention and safety tools so you can focus on other key operational tasks for your commercial kitchen. Begin your partnership with Flue Steam today! We look forward to hearing from you when you call 800-700-FLUE.